24/7 EPISODE 2 - PACQUIAO: "I WANT THIS FIGHT"
HBO's award-winning franchise "24/7" returned tonight with episode 2 of "24/7 Pacquiao/Marquez", the all-access reality series following pound-for-pound champion Manny Pacquiao and lightweight king Juan Manuel Marquez as they prepare for their November 12 showdown at the MGM Grand Garden Arena in Las Vegas, Nevada. "When I was elected as a Congressman, it's hard to balance boxing being a Congressman, but it's better now, and when I'm in training, I can focus on the fight in training and when I'm in Congress, I set aside boxing and focus on being a Congressman...I experienced that life before when I was young, so whatever success in my life, my heart is always the same when I was young...I want this fight, man," Paquiao would comment, making it clear that although Marquez is an important fight in his career as a boxer, he has a much bigger fight on his hands helping his people as a Congressman. 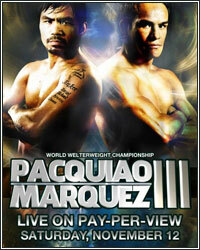 Check out what else Manny Pacquiao had to say in episode 2 of 24/7 Pacquiao/Marquez. "When I was elected as a Congressman, it's hard to balance boxing being a Congressman, but it's better now, and when I'm in training, I can focus on the fight in training and when I'm in Congress, I set aside boxing and focus on being a Congressman." "I experienced that life before when I was young, so whatever success in my life, my heart is always the same when I was young." "I gave them a fresh livelihoood so we have income every day to buy food and to survive every day. I'm satisfied with what I have done being a Congressman, but I have a lot of things to do. It takes time to accomplish that." "My first time in United States, we came to San Francisco and we diced to ride Greyhound bus going to LA. When we get to LA, my manager looking for a gym that we can work out and somebody told us, "Oh, there's a gym there. Wild Card gym." We went to the gym and we met Freddie Roach on that day. After that, that's the beginning." "Manny's one of those guys, he's not going to give you everything in sparring. He's going to give you about 50-60%. I mean, he's going to save the good stuff for the fight." "With him, you can lose your mind because he drives you crazy with his style. He's in and out, right...with a lot of speed and power." "He seemed warm. He's on a good day today. I said, 'Oh, I'm in trouble.' And then, as soon as I get hit with the first straight left, I knew it was going to be a long three rounds for me." "Usually he comes in just to do his work, you know. He comes in, does his work, and gets out, and it's pretty awesome, you know. Today it seemed different, like there's a bit more venom in his punches. He seems to be spot on." "I want this fight, man." "I feel like I can spar more. I can spar more. I can spar like 8, 9, 10 rounds."